By the winner of the 1988 Nobel Prize in Economics, an essential and paradigm-altering framework for understanding economic development--for both rich and poor--in the twenty-first century. 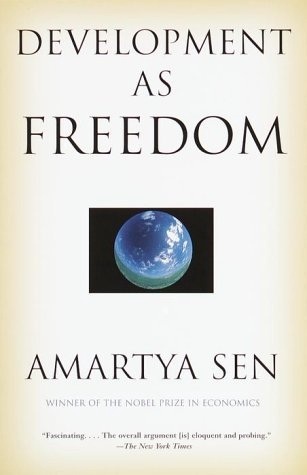 Freedom, Sen argues, is both the end and most efficient means of sustaining economic life and the key to securing the general welfare of the world's entire population. Releasing the idea of individual freedom from association with any particular historical, intellectual, political, or religious tradition, Sen clearly demonstrates its current applicability and possibilities. In the new global economy, where, despite unprecedented increases in overall opulence, the contemporary world denies elementary freedoms to vast numbers--perhaps even the majority of people--he concludes, it is still possible to practically and optimistically restain a sense of social accountability. Development as Freedom is essential reading.